Dive into an experience of a complete restorative practice. With a help of gravity, props, and passive stretches, the body slowly lets go of resistance at the places where it accumulates stress and tension, paving the way for healing to occur. 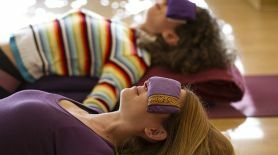 Over the weekend you will learn how to enter, maintain and exit many different restorative poses that deal with stress, insomnia, depression, chronic fatigue, menstrual discomfort, difficulty to breath deeply, and shoulder and back pain. You will learn different sequences, which you can then make into a daily routine, in order to feel the profound healing effect on your whole body-mind-soul structure. Examining the benefits of restorative poses. Learning how to lead a restorative class, how to use the props, what to be prepared for, how to make the best economy of time and other. Practicing helping a student assume a restorative pose. 2. Restorative yoga sequence for easy and deep breathing and as a preparation for meditation. 47 Euros per session, or 180 Euros for all 4. Maja is a yoga teacher and teacher trainer, as well as a founder of Athens Yoga, Greece. Her life and teachings are dedicated to connecting with people with devotion and care, offering the wisdom of yoga in a dynamic way that respects the needs of each individual, inviting them at the same time to unfold their true and full potential. She is most interested in exploring the ways in which physical practice, breath, mind observation and yoga philosophy can all be combined and used in everyday challenges that life presents. In Maja’s classes, the practice of yoga and life itself become one and the same. Yoga becomes a tool for healing all human relationships, including the relationship with oneself. It contributes to the emotional maturity of the individual and brings about the spiritual elevation and growth of the collective. Anna teaches hatha, prenatal, partner and restorative yoga. Her first contact with yoga was random- somewhere between dance and gymnastics. Anna's teaching focuses on alignment and draws inspiration from everyday life, indian philosophy and mythology. She has a regular practice and she continues studying and training. Anna is a surveying engineer and internet radio producer. "The question I had when I first came to yoga is now my primary concern in teaching: to encourage students to discover their potential and expand the qualities of their practice in their everyday life . "